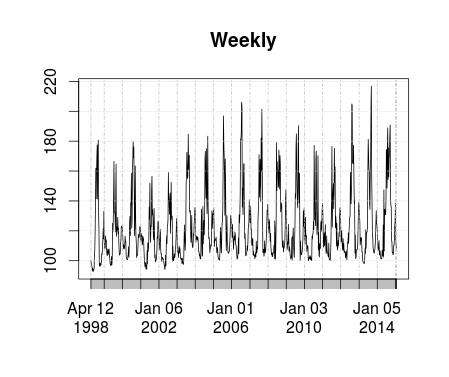 The goal of this challenge is to make use of public data (SCE DLP) and practice time series analysis. 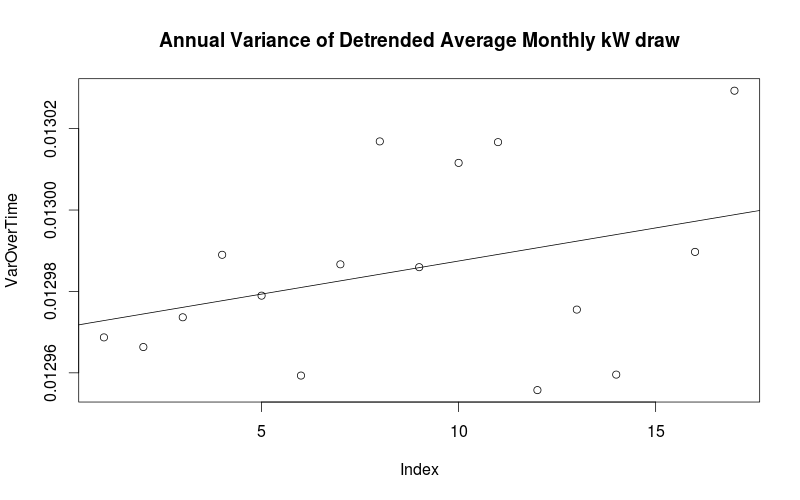 We will be looking at the average residential customer in SCE territory using R as our analysis software. 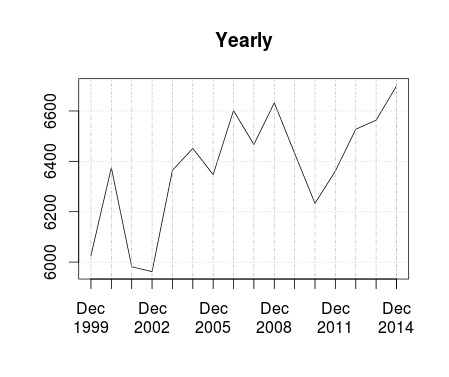 Load SCE Dynamic Load Profile Data from 1998 to 2015, merge these individual files, and export as csv for future reference. 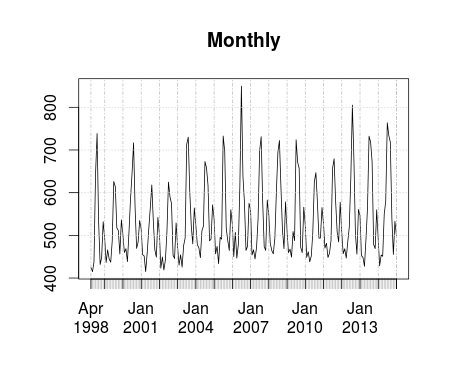 Lets look at the daily, weekly, monthly, and annual sums to get a first impression of trends and seasonality. Decompose the hourly DLP using an additive model and a multiplicative model. 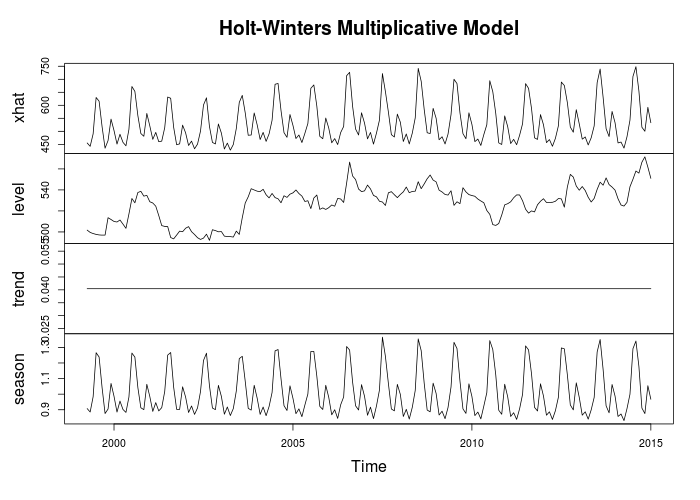 A multiplicative model is best used when the variance of the seasonality increases over time. 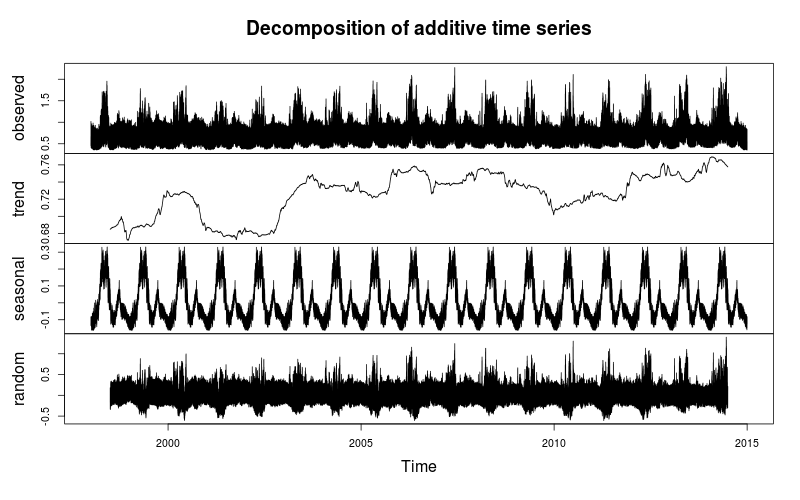 It appears that the variance of de-trended annual consumption is increasing over time and a multiplicative decomposition model might be optimal. 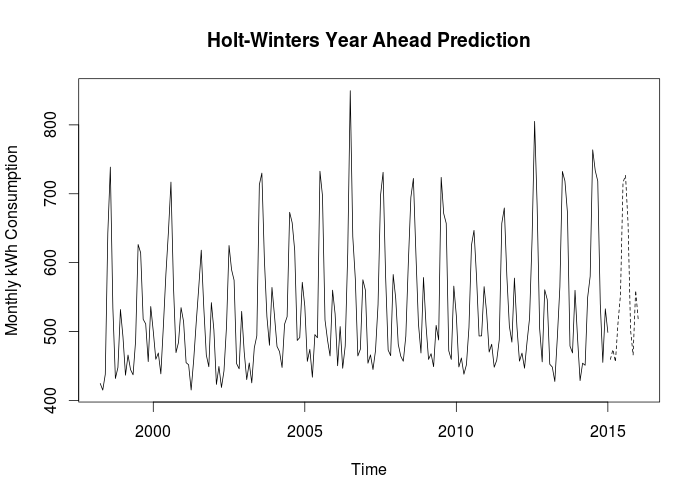 Lets inspect for hourly auto-correlation of the data after we’ve removed the trend and seasonality leaving just the random residual. We do this using a correlelogram. The x axis is in units of hours in this chart. 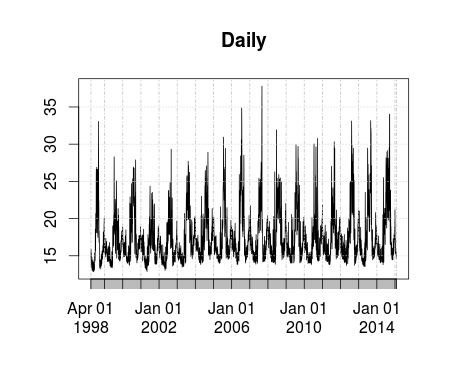 We can see a 24 hour auto-correlation for consumption that may be decreasing over time. Lets see if there is daily auto-correlation. 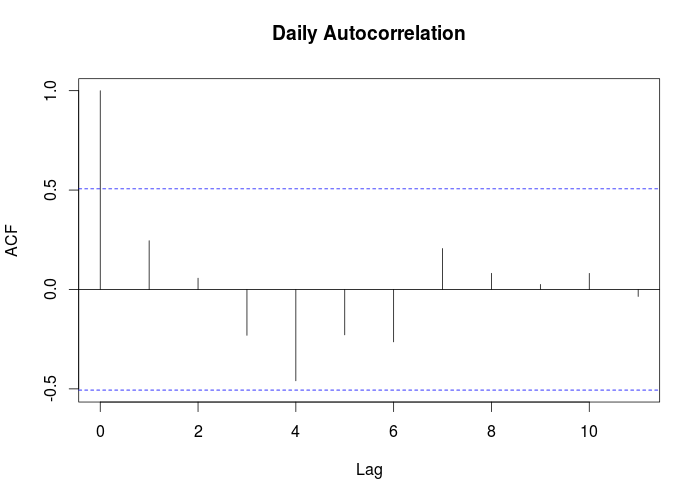 There is a high degree of daily auto-correlation. We need to assess how well our model is performing. A common metric is the mean square one step ahead error. The mean square one step ahead error is 34 vs. the standard deviation of 90 which is a significant improvement. 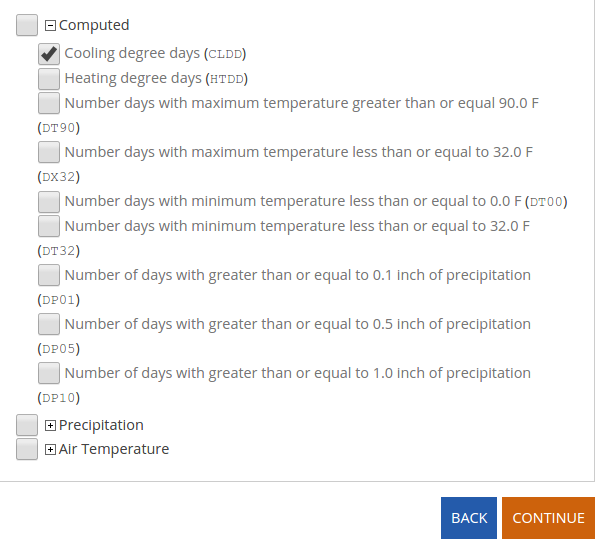 Alpha, Beta, and Gamma are smoothing parameters that correspond to the level, slope, and seasonal variation. 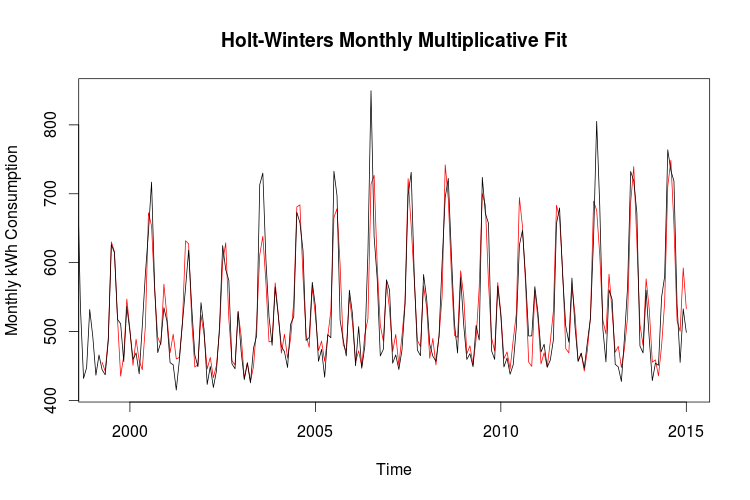 The Level and Seasonal variation adapts rapidly whereas the slope does not. Lets try and use a simple linear regression for day ahead modeling. 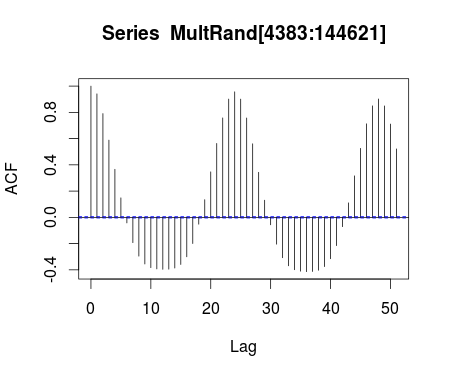 As a diagnostic test let’s plot the autocorrelation of the residuals in order to see if there is systematic bias. 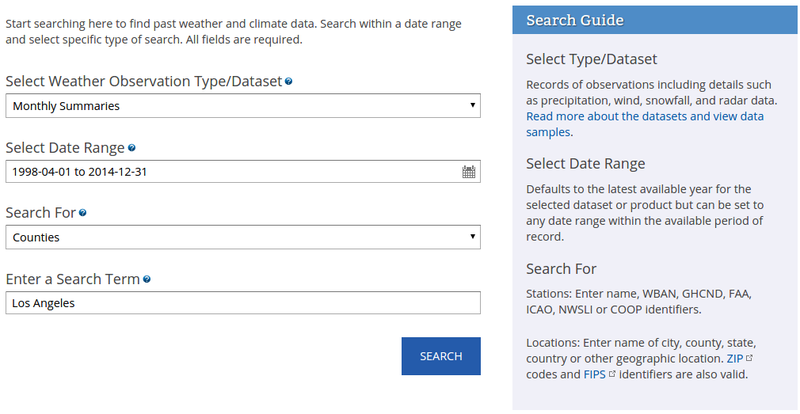 The Next step in this analysis is to download monthly cooling degree data from NOAA for Los Angeles County for the time period of interest 4/1998 to 12/2014. See the documented code for this competition at my github page. The goal of this competition is to familiarize users with the Scikit learn module in Python for Data Science and Prediction. During this competition (It had already expired but you can still submit entries) I conducted exploratory analysis, visualization, data pre-processing, regularization, resampling, and modeling all in Python. 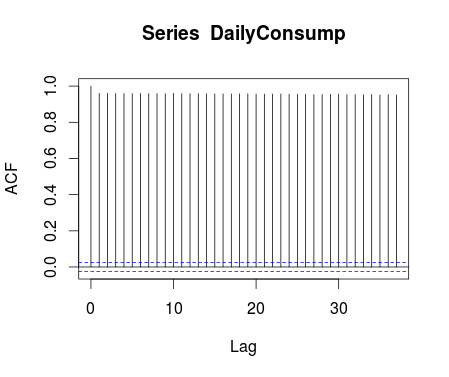 The goal was to accurately predict a logistic output using 40 features based on a training and test set. I first checked for outliers, skewness, and multicolinearity before proceeding further because this will effect model performance. After centering and scaling my features (transforming the distribution was unnecessary) I then tried a few regularization techniques and ended up using Tree Selection and the Lasso method. I tried many different models using a 10 fold cross validation on my training data. Mistakes and improvements: One interesting result was that scaling and centering my data provided no measurable improvements in my ranking with or without this pre-processing but this is a minor thing because it did not hurt performance. I found it interesting that during my 10 fold cross validation SVM did not outperform Random Forest so I would imagine that Random Forest would end up being my best model. However after I predicted the test data using the same regularization scheme as I did for Random Forest, SVM ended up winning by a large margin. Because the training set consisted of 1000 data points and the test data set consisted of 9000 test data points I might want to consider a resampling method other than 10-fold cross validation. For example I might want to do a repeated bootstrap resampling or a 50/50 split because my training set is much smaller compared to the test data set.